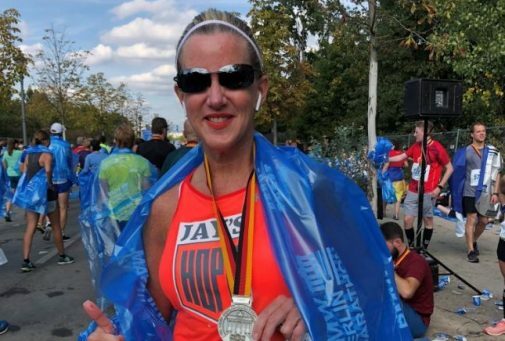 Three days off completing the Berlin Marathon – my 21st marathon – I can’t help but reflect on the many life lessons harvested from not only the grueling 26.2 miles of the race itself, but the countless hours of training that led up to those clocked miles. Like so many things in life, defining the motivation – the larger purpose, the drive behind why you do what you do – is so very powerful. It is this underlying mission that will power your through the hard times and bring you joy during victories. My why for running marathons has evolved over the course of these 21 events. While I have always fancied myself as a fitness enthusiast, as my age advanced, I sought a way to challenge myself and to advance my overall health. As my kids grew older, my why focused more on remaining healthy for my family and setting an example for my three children that anything could be accomplished with commitment and hard work. However, nearly four years ago when my oldest son Jay became ill with cancer, my why became much bigger. As I watched his heroic battle with this dreadful disease, I was in awe of his strength and determination to fight and to continue to live each day to the fullest. As the debilitating treatment caused his body to weaken, he continued to seek new physical challenges to accomplish: basketball, snowboarding, hockey and golf. He had run several races with me over the years and just before he became ill he shared that he wanted to one day complete a marathon with me. Jay lost his battle in 2016 and now his memory has become my why. I run to honor his desire to keep fighting, keep pushing. I run to raise awareness of and funds for Jay’s Hope – the organization we founded in his memory to offer hope and support to other college students battling cancer. Just like marathons, life is often filled with peaks and valleys – whether relationships, finances, careers or health. While it is easy to get sidetracked or to become paralyzed at the overwhelming challenges ahead, one of the most important things is to keep moving forward. While at the time a snail’s pace forward may seem to no end, it undoubtedly will get you closer to the finish line of whatever challenge life has thrown at you. Especially during my most recent marathon, this proved true. Plagued with a painful foot injury just a few weeks before I headed to Germany, the last 13 miles to the finish line felt insurmountable. I had always prided myself at not walking on race day. Yet I soon realized that any forward movement, despite the pace, would ultimately bring me to the Brandenburg Gate and the glorious finish line. Marathons are full of distractions. From injured runners along the course to runners who all seem to be passing you by, from the distasteful smells of local restaurants cooking bacon (I am a vegetarian), to unpleasant odors of fellow runners in a close pack, from landmarks with difficult memories to unwelcome elevation changes along the course – aka HILLS! Isn’t life full of distractions? Someone once told me that marathons are really 70 percent mental and only 30 percent physical. Can’t the same be said for life in general? Like marathons, life if full of many distractions. The key is living, or running, with focus. As the starting gun or horn sounds during each of my marathons, I make a very intentional decision to close out the interferences – the sounds, the smells, the course changes – and to focus on the end state. 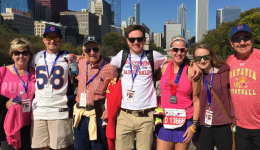 I often dedicate each mile to a special person in my life – my husband, my kids, my parents. This focus not only helps narrow down the miles and the time – it provides me with a mental boost taking me back to my why. Marathoner goals are as unique as the over 44,000 individuals who completed the Berlin Marathon on September 16th. The importance is not as much as what the goal is – but the goals within itself. We all likely remember that advice from a young age to set goals – even to write them down in a special notebook for safe keeping. Like my evolving why – my marathon goal has continued to change. I first set out to run a marathon every year until I turned 40….check. I then decided my goal was to complete 10 marathons….check. Then 15….check. Then 20…..check. My newest, and perhaps final, marathon goal is to complete my “six star” or the Abbott World Marathon Majors: Berlin, Chicago, Boston, London, New York and Tokyo. Marathon running has continued to reinforce the importance of goal setting for me – both personally and professionally. It has also reminded me that while your goals may evolve as your life does – you should always seek to define goals for your next stage of career or adventure. While the thrill of crossing that finish line is certainly an adrenaline high, I have no doubt that the real victory for me is the countless life lessons the miles have taught me. Defining my why, moving forward, keeping focus and setting goals are four teachings that not only have allowed me to complete 21 marathons – they are teachings that have guided how I live my life each day. They are learnings that I will again pull from as I set out to run the Chicago Marathon in a few weeks and then Tokyo in February – marking the completion of my six star goal. Looks like it will soon be time for me to work on that next fitness goal….. Awesome story Kelly! Big congratulations on Berlin! I am sending you all my good luck that your foot is better for The Chicago Marathon in a couple weeks.Your lucky family and your amazing son Jay must be so proud of you!! When I finish grad school next year I am going to run The Chicago Marathon again and dedicate a mile for your Jay. Stay awesome Kelly and RUNLIKEAMOTHER!! Thanks for the kinds words Mary Frances! Congrats on your grad school. I am touched by your offer to dedicate one of your next marathon miles to my son! RUNLIKEAMOTHER…love that! ← Should you be drinking pickle juice post-workout? Kelly Jo Golson, contributor to health enews, is chief marketing officer for Advocate Aurora Health.